In 2011, i09 released an article revolving around Mer-physics. It talks about the ways in which the merfolk are able to use their senses underwater, from seeing, to hearing, to tasting and smell. For example, did you know that most of the mer are unable to see the color red? The color doesn’t exist at the depths in which they reside. According to many so urces, mermaids mate and form lifelong bonds, never seeking a second relationship if something happens to their other half. Author Tera Lynn Childs twists this theory in her mermaid duo, FORGIVE MY FINS and FINS ARE FOREVER, making it so that the first person a merperson kisses becomes his or her bonded mate, even if it was an accident. Unlike what you see in Disney’s THE LITTLE MERMAID, merfolk don’t have underwater castles the way bipeds have land castles. Instead, they live in deep-sea caves and crevasses. Sometimes, a series of caves winding together will be the dwelling place for what could be called mer-royalty. Some savvy merfolk might make a kingdom out of coral more befitting a human’s imagination. The reason many humans believe there are no mermen, only mermaids, is because the males never surface. 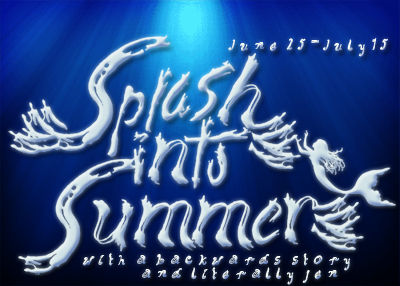 They’re not interested in looking at land-dwelling bipeds and daydreaming when they could be hunting for food for the tribe or protecting their families from dangerous sea-dwellers such as sharks or jellyfish. Mer weapons include tridents made from whale bone or coral or metal pulled from shipwrecks, sharp shells, shark teeth, or octopus-ink darts. 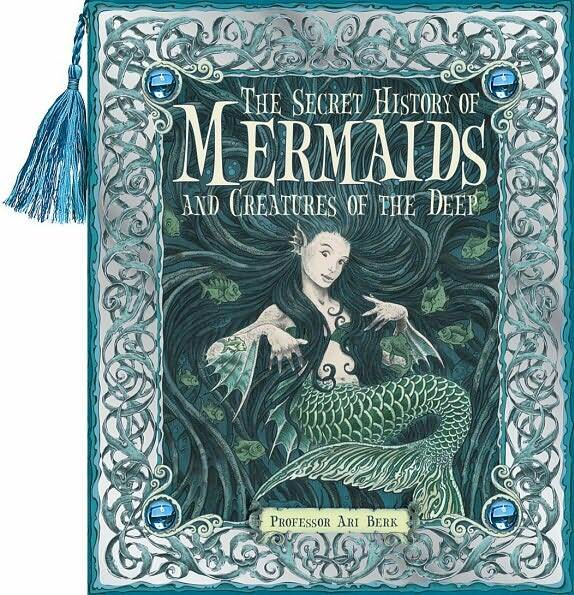 According to THE SECRET WORLD OF MERMAIDS, compiled by Francine Rose, there are 15 species of mermaids, including Shipsavers, who are duty-bound to save humans lost at sea (and some of the most commonly-spotted mermaids), Weaterworkers who can control the wind, moon, waves, and/or tides, and Pearlweepers, who leave the sea in search of true and shed their tails while on land, each step more painful than the last. 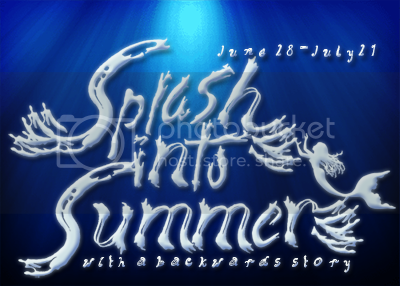 Many novels depi ct shapeshifting merfolk in a way that belies how hard it is for a mermaid or merman to become human. They simply shift from tail to feet and back again. 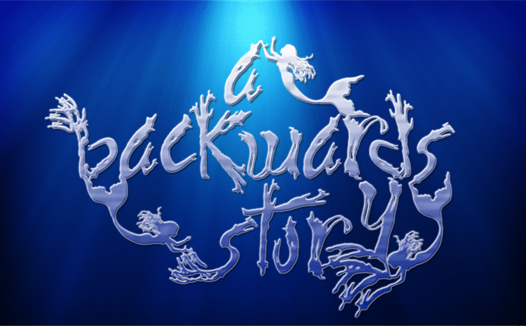 Most of the older tales, written when the balance between merfolk and bipeds still remained intact, emphasized how painful the transition is. A mer’s tail is cleaved in two in order to form legs. Some tales even state that every step a mer takes on land causes pain and undue duress. Changing from human to mer is also an excruciating process as one’s legs lose muscle and bone as they weld together. A human’s lungs must also balloon out in order to filter air through the water. Is it any wonder that in tales such as THE LITTLE MERMAID, sacrifices such as one’s voice must be given in order to change forms? Popular sea accessories include shell crowns, pearl necklaces, conch hats, and kelp bracelets. Some people believe that merfolk existed until something unspeakable happened and Poseidon struck them all down, turning them into ordinary fish and creating the species that inhabit our oceans today. Author Sarah Porter has another theory, believing that there are only mermaids, created when something horrible happens on land to a girl. When she dies too young, she instead becomes a mermaid. Others think that merfolk still live among us today, but remain out of sight. Perhaps they are watching us in plain sight, but their magic is too great and we can’t tell them from another human being. 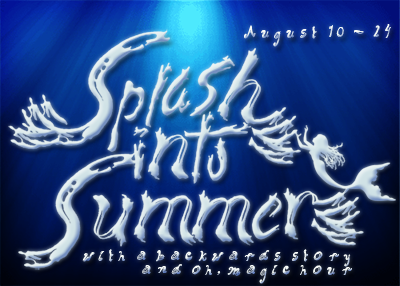 Sirens, selkies, and shape-shifters are the three most-written-about types of merfolk. Sirens have beautiful voices and can lure sailors to their doom against the rocks. Selkies are a type of mer cousin, seals that can shed their skin and walk among humans. If their skin is stolen while on land, they are forced to remain as a biped unless they can find it and return to water. L.K. 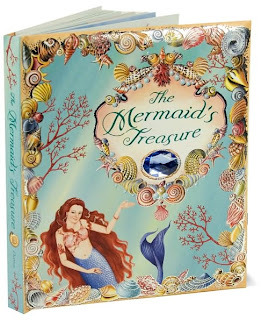 Madigan introduced a twis t in THE MERMAID’S MIRROR where merfolk possessing a seal’s skin can bring humans beneath the surface to their world. Shape-shifters, of course, are merfolk and their cousins able to transform into bipeds and walk above the water. 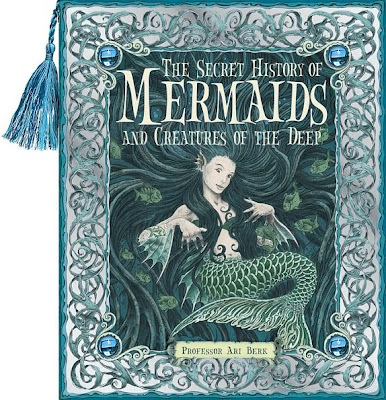 According to THE MERMAID’S TREASURE, mermaids don’t just live in oceans and reefs, but can be found by waterfalls, rivers, swamps, and even fountains, depending on the species of merfolk. Some tales depict merfolk as more animalistic in nature, while others show them as civilized as their human counterparts. It is widely believed that living underwater makes one more wild and harder to tame. Most lore depicts merfolk with pale skin unblemished from the sun. Some tales depict merfolk with skin similar to land-dwellers, while others show them with skin colors such as blue, purple, and green that camouflage them from underwater predators. 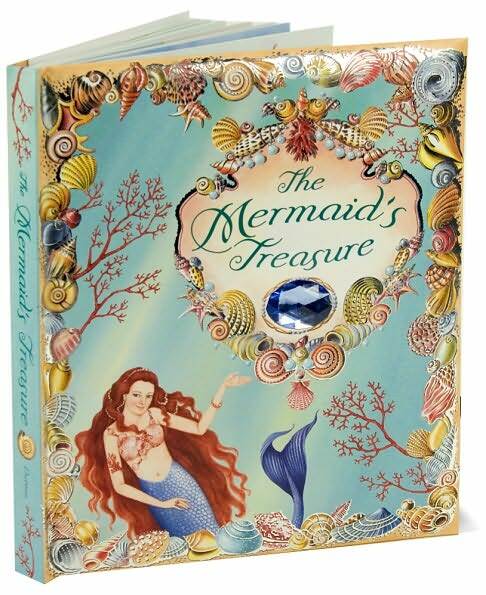 In MERMAID by Carolyn Turgeon, it is speculated that mermaid skin is hard like a diamond to protect from cold. When a mermaid touches a human, she leaves behind a mark that looks like shimmering fairy dust. 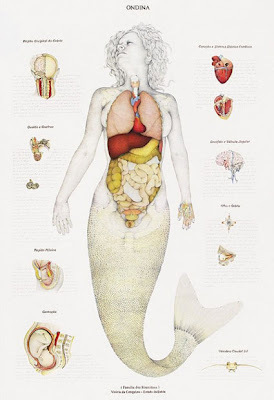 studied a mermaid's internal organs and created a chart showing us what goes where. For those still curious about such topics, check out some smutty romance authors. Joey Hill and Devyn Quinn, for example, will be more than happy to tell you what goes where! Being in the medical field, I found the mermaid anatomy chart very interesting. What cool interesting facts, you're a mermaid professor now! That's neat, plus I liked the idea of plankton pie and the anatomy chart was quite interesting as well. Haha, mer anatomy. I can't believe how many conversations I keep getting into on that topic. And I had totally forgotten about selkies! Do you know of any books with them as characters? I'm curious. @Gina: I thought the anatomy chart was brilliant. Someone spent a lot of time creating what we've all wondered! @Lena: A mermaid professor, I like that! Doesn't plankton pie sound delicious? Ariel was eating it at her pretend wedding in my storybook. I totally want to make my merfolk eat some pie! @Belle: I know, right? Who doesn't want to know that? Not fish, not human, so how....? @Jackie: I know, right? When I joke that I was a mermaid in a past life or talk about my future mermaid novel, people ALWAYS ask me about anatomy. It's a hot button topic! Oh, mer-toilets! @_@ I never considered that aspect! I can't wait to see how you handled it!! @Flashlight: Isn't the web amazing? I think I found that anatomy chart b/c it was featured on Yahoo! News when it first came out. I bookmarked it, weirdo that I am ^.~ Selkies, yes! There's a teen novel that came out...I want to say in 2010? Maybe 2011... It's SELKIE GIRL by Laurie Brooks. I'm hoping to read it during Splash, and will prioritize it for you, darling! There was another selkie book I loved when I was younger; I wish I could remember its title now. @Small: I know, riiiiiiiiight? I just HAD to share that! omg these were so fun! 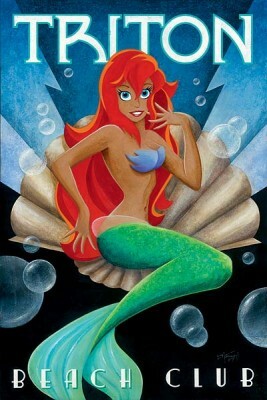 i always thought that if a mermaid were to reproduce she would have to lay eggs and wait for a male to fertilize them! i also figured mermaids would have a cloaca like a reptile. this is still a really great article! Are they really true, and did they exist in real life?